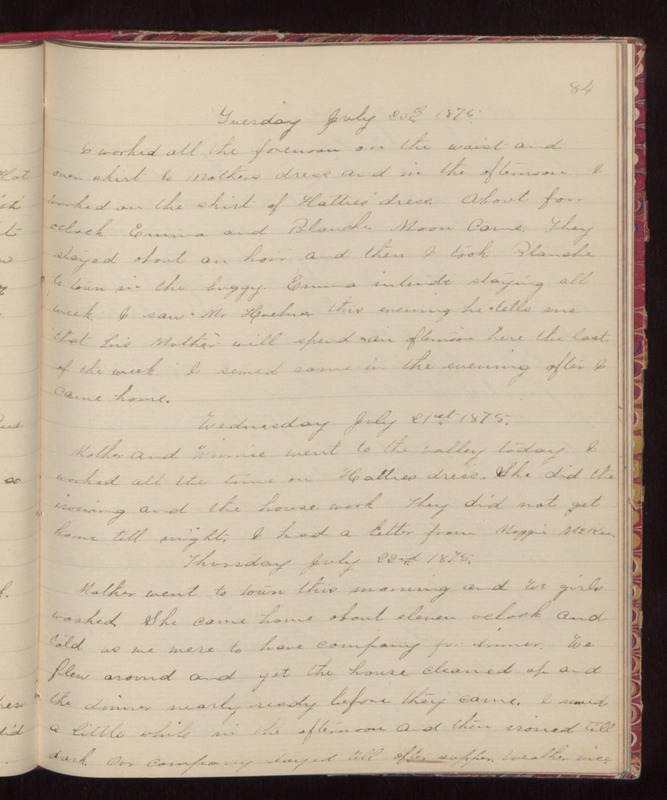 84 Tuesday July 20th 1875. I worked all the forenoon on the waist and over-skirt to Mothers dress and in the afternoon I worked on the skirt of Hatties dress. About four oclock Emma and Blanche Moon came. They stayed about an hour and then I took Blanche to town in the buggy. Emma intended staying all week. I saw Mr Huebner this evening he tells me that his Mother will spend an afternoon here the last of the week. I sewed some in the evening after I came home. Wednesday July 21st 1875. Mother and Winnie went to the valley today. I worked all the time on Hatties dress. She did the ironing and the house-work They did not get home till night. I had a letter from Maggie McKee. Thursday July 22nd 1875. Mother went to town this morning and we girls washed. She came home about eleven oclock and told us we were to have company for dinner. We flew around and got the house cleaned up and the dinner nearly ready before they came. I sewed a little while in the afternoon and then ironed till dark. Our company stayed till after supper. Weather nice.